Lechlade-on-Thames - The small Cotswold market town of Lechlade is situated at the southern borders of the Cotswolds where the Rivers Coln and Leach join the Thames, and Inglesham, just above Lechlade, marks the head of its navigation. For centuries Lachlade was on one of the main trade arteries west from London, by both road and river. 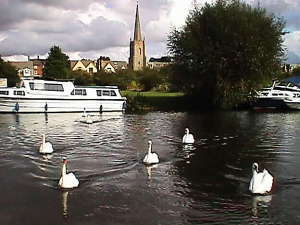 Leisure boats have replaced the trading vessels for Lechlade is now a favourite mooring place. To the east on the A417, near the confluence of the Thames and the Leach is St. John's bridge, reputed to be the first stone bridge over the Thames outside London. The original structure dates back to 1229, but was rebuilt about 1830. 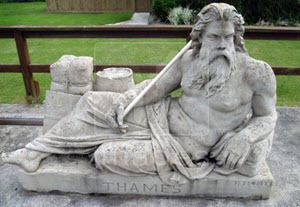 Near the bridge is St. John's lock overlooked by a statue purporting to be Father Thames, brought here from its original site near the source of the river. To the south the A361 road crosses the Thames with the old tollbridge, the 18th century Halfpenny bridge. Annual Event over 3 days usually in May - one of the best festivals in the Cotswolds. Rock to reggae, pop to punk, jazz to jive, folk to funk, indie, jazz, world music, hip-hopera & more! Top quality live music for everyone. Free workshops for all the family, real ales, camping & family festival fun! It was at Lechlade where stone from the quarries at Taynton was put into barges for transport downstream, where it was used in many buildings including Windsor Castle, many Oxford Colleges and St. Paul's Cathedral. St. Lawrence's Church. The spire was descibed by the 16th century antiquary John Leland in his famous Itinerary 'as a pratie pyramis of stone'. The interior is handsomely proportioned with high clerestory and a magnificent chancel roof with carved bosses. It was the churchyard at Lechlade that inspired the poet Shelley to compose his Summer Evening Meditation, and there are few better places to stop awhile than this quiet corner. River Thames trips are available (subject to weather and river conditions) aboard the luxury Thames launch Inglesham throughout the summer season (April through to September/October). The departure point (see map above) is on the south bank of the river from the popular Riverside Park (by kind permission of Cotswold Water Park Society) and trips will take about 30 minutes. Crews will be available to waft you gently up-river every weekend and Bank Holidays (and possibly weekdays as well during the height of the summer subject to other bookings). Normal operating times are from 11:00 until 17:00. The churchyard at St Lawrence Church, Lechlade-on-Thames, inspired the poet Percy Shelley to compose A Summer Evening Churchyard during a visit to the Cotswold town in 1815. The path through the churchyard is now named after him - “Shelley’s Walk”. Lechlade is the highest town to which the River Thames is navigable by relatively large craft including narrowboats. It is possible to travel by river or on foot from Lechlade to London. The highest lock on the Thames is St John's Lock, at Lechlade.